Preserving our Past, Building our Future: What In The Heck Is That Thing? What In The Heck Is That Thing? Glad that you asked! 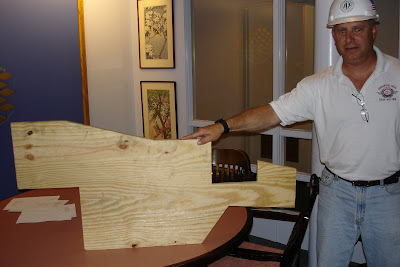 What Lou's holding is a plywood template for the profile of the edge of the roof. One of these will be attached to each of the trusses to guide the placement of the cornices, flashings and moldings. The square cutout space right below Lou's outstreatched arm is where the new gutter will go.